Japan has released the 30-y Bond Auction and M2 Money Stock y/y data and the US will publish 30-y Bond Auction, Natural Gas Storage, Import Prices m/m and Unemployment Claims. 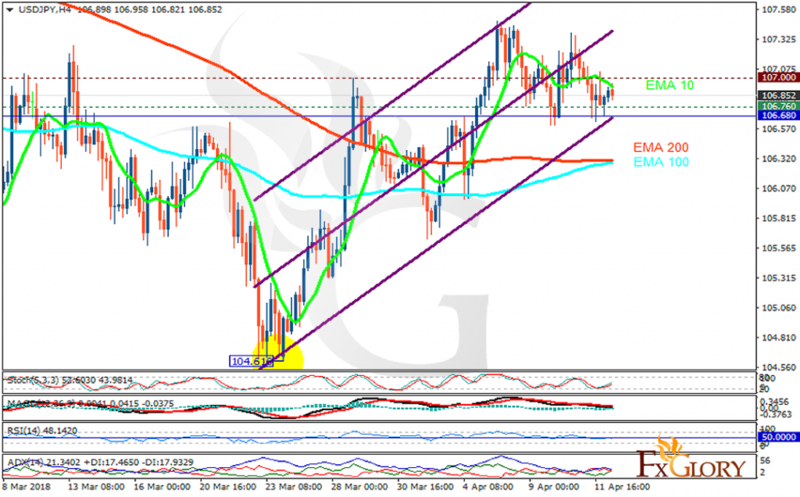 The support rests at 106.760 with resistance at 107 which both lines are above the weekly pivot point at 106.680. The EMA of 10 is moving horizontally in the ascendant channel and it is above the EMA of 200 and the EMA of 100. The RSI is moving on the 50 level, the Stochastic is showing upward momentum and the MACD line is below the signal line in the negative territory. The ADX is not showing any clear signals. The indicators are showing mixed signals therefore the price may drop towards 106.5 but it will remain the floor of the market, then buyers can target 107.5.